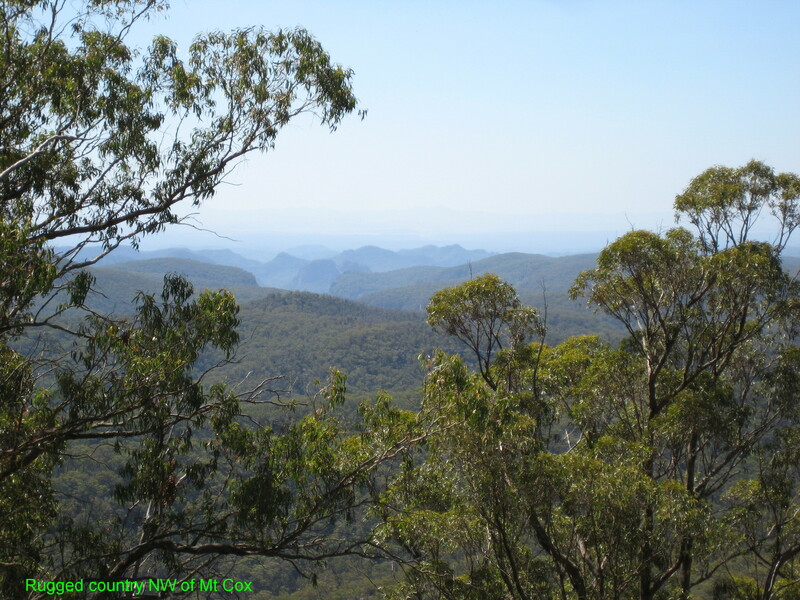 Mt Pomany along with Mt Cox within the 501,703ha Wollemi National Park was the ultimate destination of a four day bushwalk over the October Long Weekend 2015. As Nullo Mtn, Mt Cox and Mt Pomany are all designated SOTA summits decided to activate these unactivated summits as part of the whole activity. Track information is given for those whom may wish to undertake their own activations or bushwalk in this area. 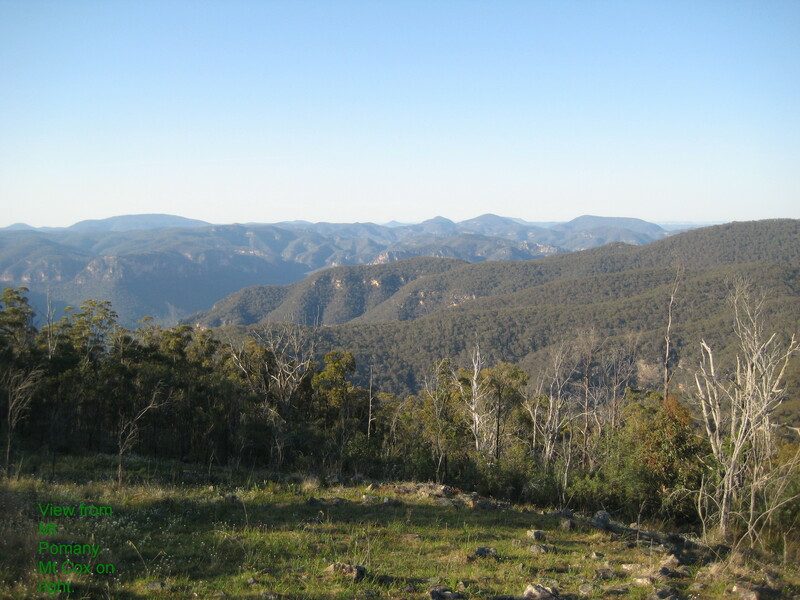 Access to this western part of the National Park is via Nullo Mountain about 60kms east of the rural township of Rylestone. 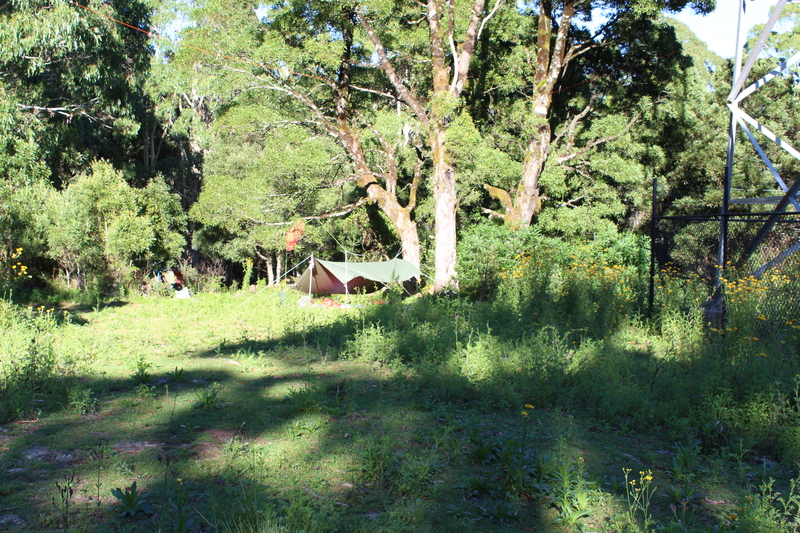 Much of the driving to Nullo Mountain is on good unsealed roads to the farming property Nullo Park which adjoins the National Park. 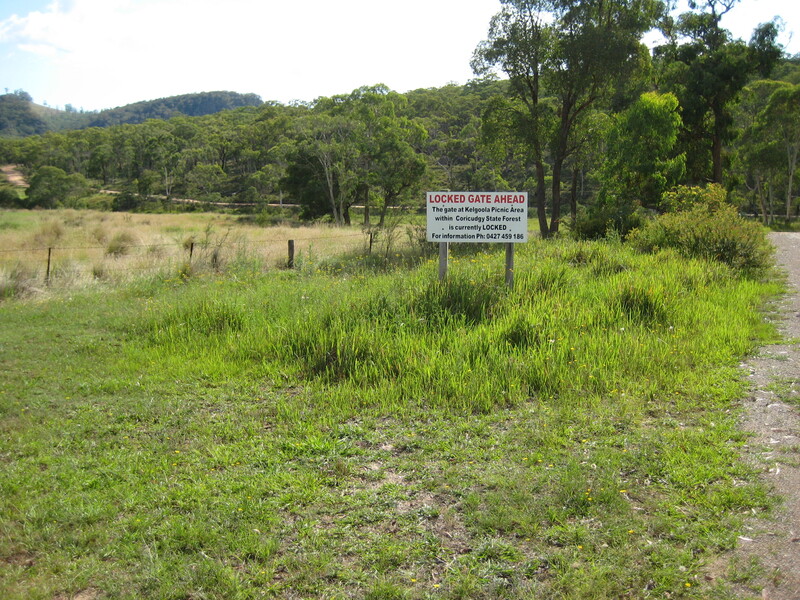 Had visited this property a couple of times previously and had permission to drive to Nullo Mountain which is situated on the property. Saturday 3rd arriving at Nullo Mountain soon had the linked dipole strung between two trees, table and chair in place, started calling around 0105Z. For these three activations used my KD1JV tribander as it is small, lightweight and very economical on batteries. 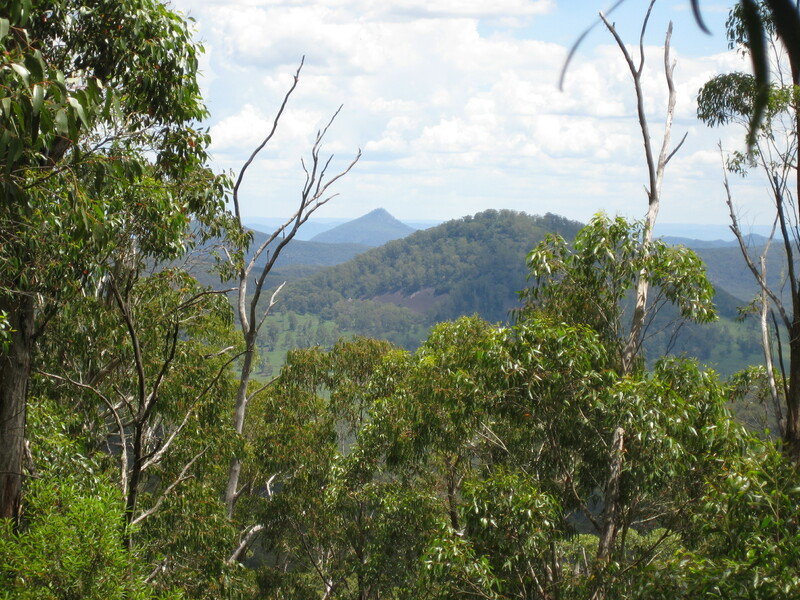 These are useful attributes for coming long walks to Mt Cox and Mt Pomany which are well in the Wollemi National Park wilderness. To my surprise there was mobile phone access which permitted self spotting. Phone access is generally poor or non existent in the Nullo area. Most distant contact was John VK6NU in Western Australia and VK7CW in Tasmania. One S2S courtesy Peter VK3PF. 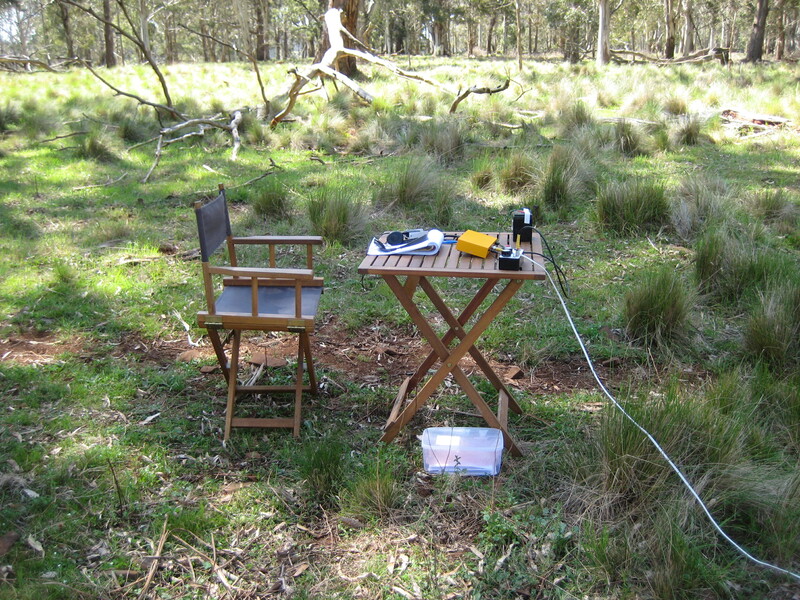 Nullo Mtn radio operating position. The next two summits were nowhere as comfortable. The above photos are the comfortable operating table at Nullo Mountain and the farming property water tank. 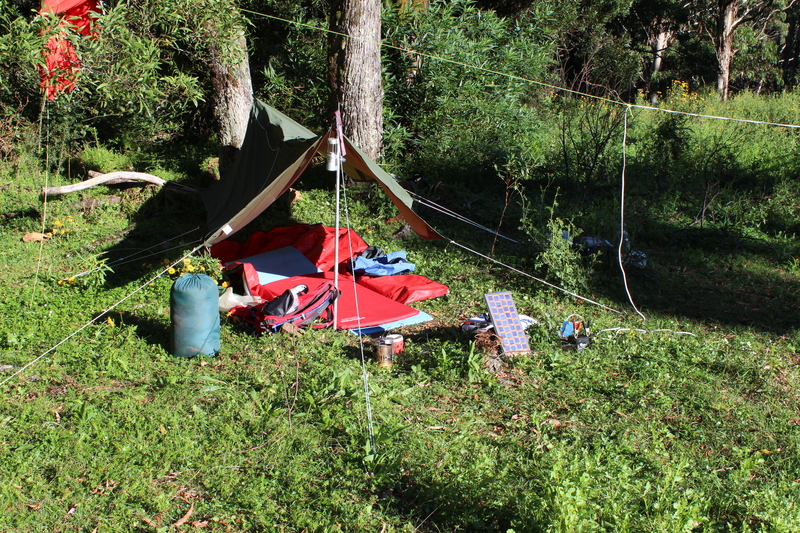 Closing down and packing up moved to my overnight campsite in readiness for the trek to Mt Cox and Mt Pomany. 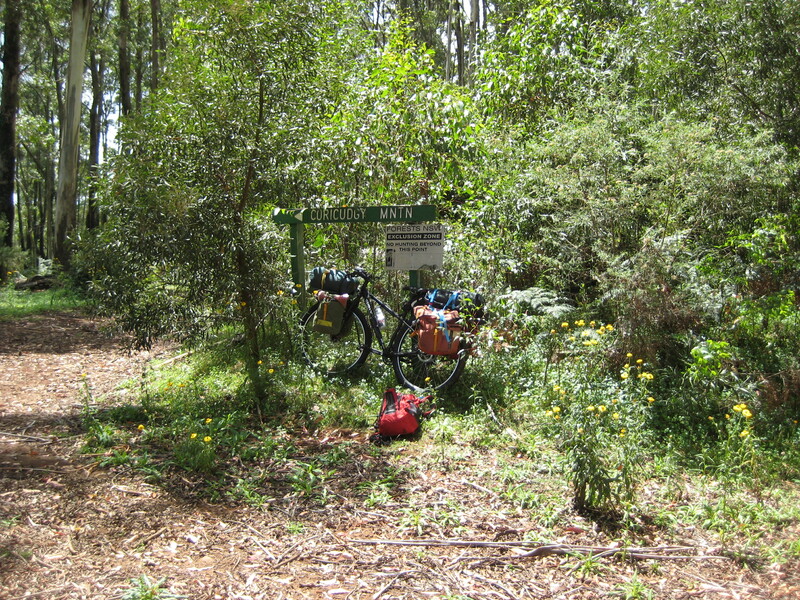 Sunday 4th carefully loaded my rucksack with all provisions and equipment for the next three days trek to the Wollemi Wilderness. Double checked everything as a forgotten item could many problems out alone in the wild. Both Mt Cox and Mt Pomany are in a rugged waterless and trackless wilderness which means everything has to be carried in. After exiting a farm gate on the western boundary walked N along Nulla East Trail for about 300 metres till I came to a tree with a yellow 10 tag on it. This marked the beginning of the old fire trail which eventually leads down to Hoolem Boy Point which overlooks Widden Brook. Excellent views from Hoolem Boy Point although on this trip did not go there. The fire trail is very steep in places, overgrown and a number of fallen trees. Came to near Hoolem Boy Point where on the left are two trees with axe blaze marks. Only one of these is visible now. On the lower part of the abandoned fire trail leading to Hoolem Boy Point are two trees blazed with an axe. 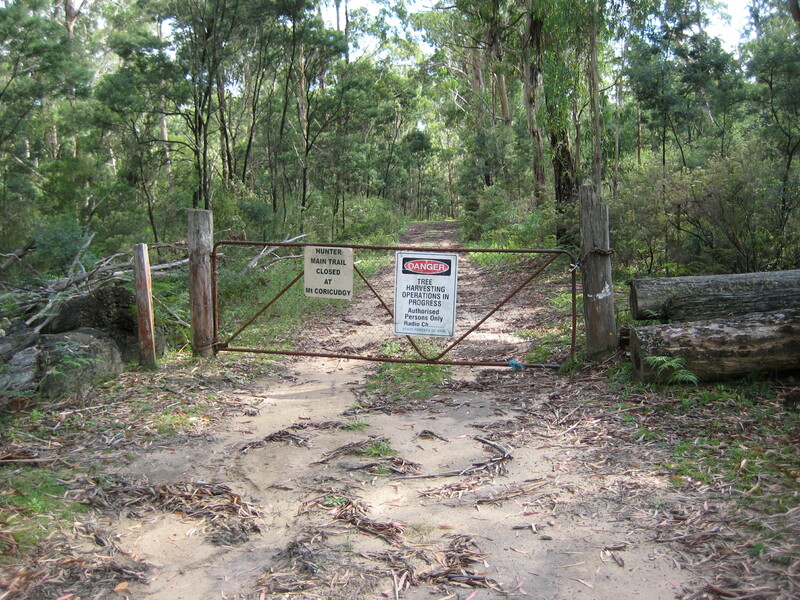 This marks the start of the cattlemans track to Hoolem Boy Gap and then onto Mt Pomany. Prominent rock just before the two trees blazed with an axe. 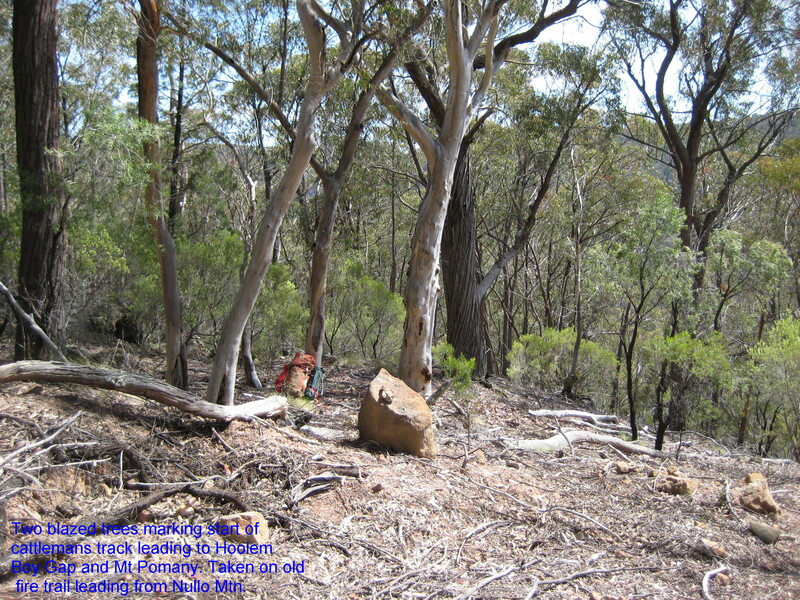 Note the large rock on the right which is a pointer to the blazed trees on the left a little further down the track. These two trees mark the start of the old cattlemans track which ran all the way out to Mt Pomany. Years ago a cattleman whom had a inholding at Mt Pomany. There was a hut and a water trough fed by a spring nearby on the side of the mountain. 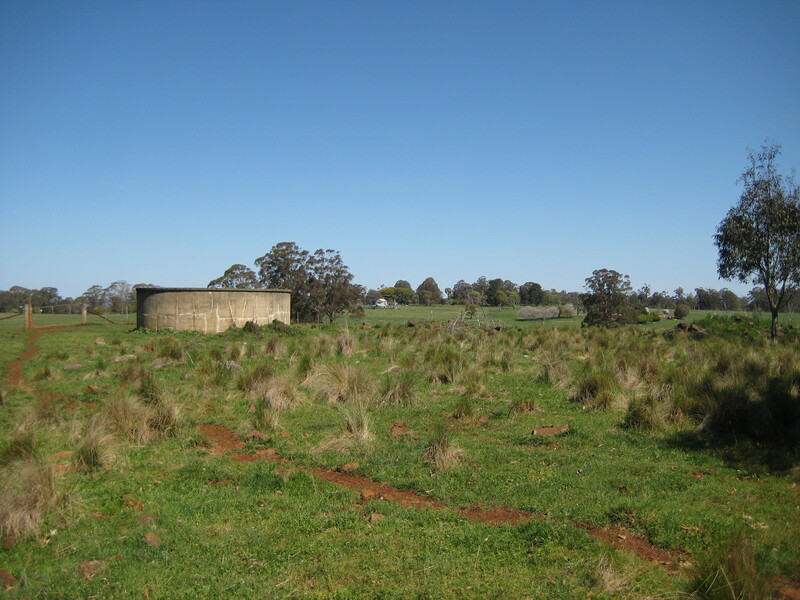 The hut was burnt down in bushfires and the water trough has long, long fallen into disrepair. There is no water available at Mt Pomany or at least none to my knowledge. 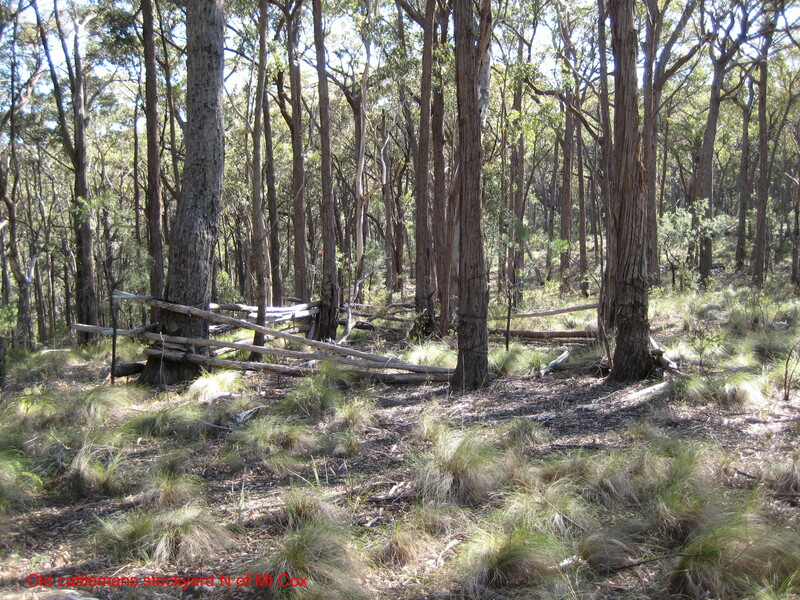 The cattlemans track to the saddle at Hoolem Boy Gap is still visible although overgrown and steep in places. There is a small open grassy saddle at Hoolem Boy gap which makes reasonable camping and most importantly is the last source of water for the next three days. The water can be found in a small creek immediately east of the saddle. Walk down the left hand side of a dry creek running eastwards and look for a line of dark green trees with bellbirds calling. There is drinkable water. 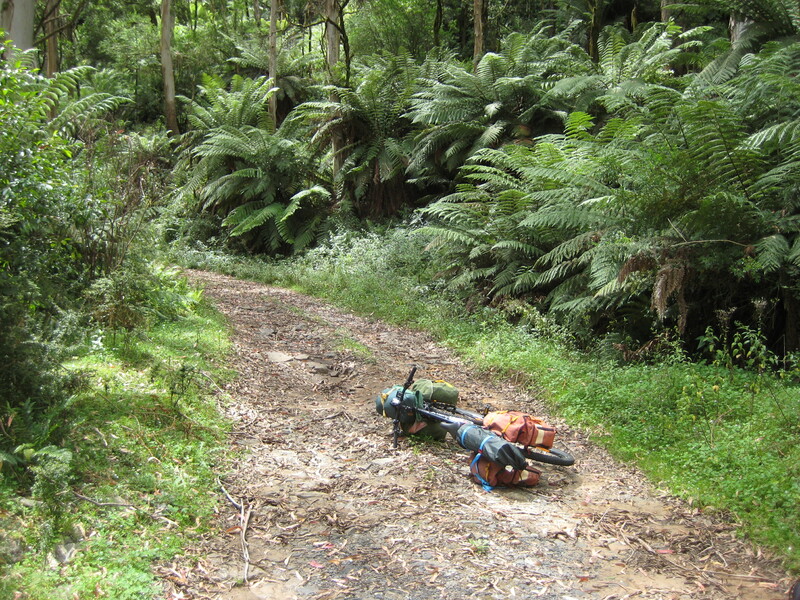 Here I filled up my water bladders to a total of 7 litres and climbed the steep slope back up to the saddle. While at Hoolem Boy left a food cache in a sealed lunchbox for the return journey. Repacked the rucksack and set off, burdened with the extra weight of water, 6.15kg or 13lbs. 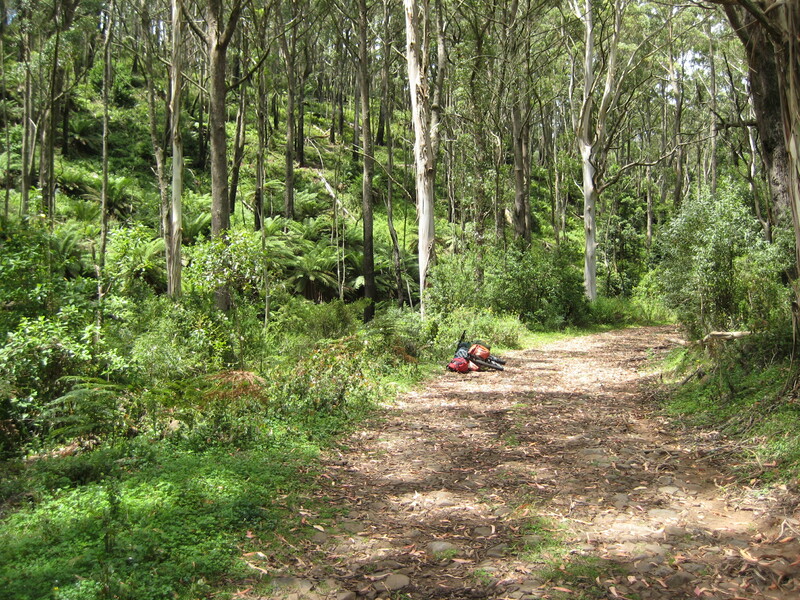 Slowly began the walk along the heavily overgrown cattlemans track up to a ridge which leads to Mt Cox. At the base of Mt Cox rested for a good while before making the final assault up the steep spur to the top of Mt Cox. In the 30C heat to say I was exhausted would be an understatement. Well there was a first time activation of this remote summit so set about to erect the dipole and late in the afternoon 0450Z started calling. No mobile phone access and was relieved when Gary VK2GAZ responded to my calls. Gary put up a spot and thanks Gary. Despite my weariness and the merciless biting march flies made six contacts plus and S2S with Peter VK3PF which successfully activated Mt Cox for the first time. Closing down 0508Z was so tired set up my sleeping mat and bag. The evening meal was a frugal repast of nuts, oilseeds and raisins. Impossible to light a fire for cooking as a wind was blowing and the whole place was surrounded by dry leaf litter and sticks. There was a real risk of starting a bushfire. 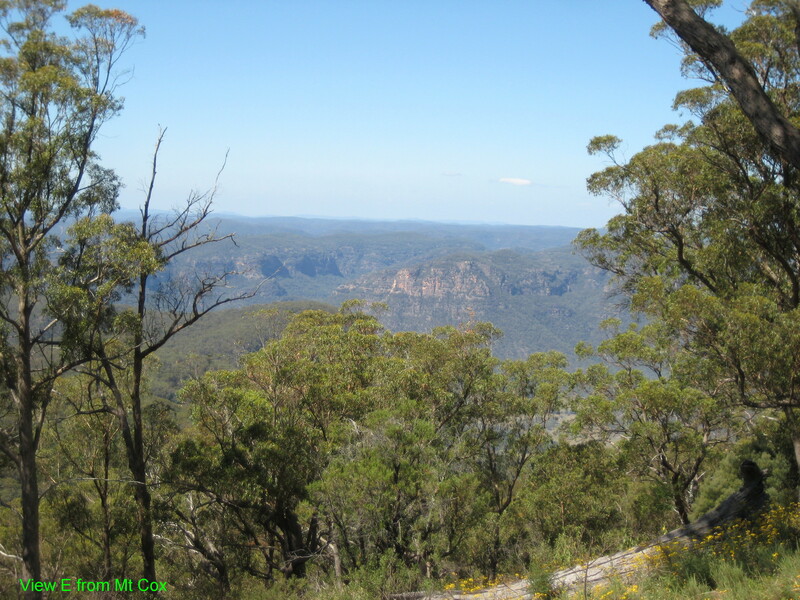 Looking N of Mt Cox with Emu Creek gorge in foreground. Old cattle mans yards N of Mt Cox. Next morning Monday 5th descended to pick up the mostly NE running ridge system which leads to Mt Pomany. On the first ridge came to a cattlemans stockyard still standing after all these years and a rock cairn a short distance further north. At the rock cairn deposited a 1.5L water cache for the return journey. Continued along the ridge line which in many places is covered with indescribably dense thorny scratchy scrub along with fallen trees. 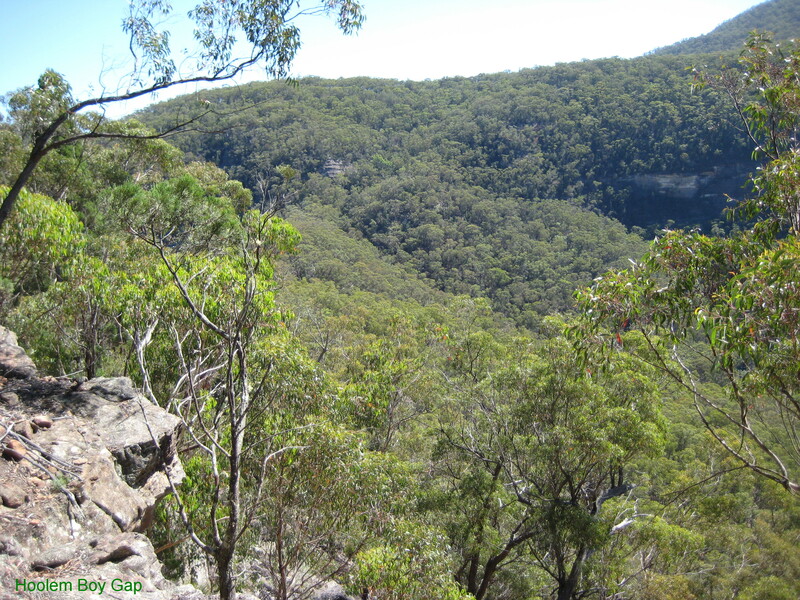 The last connecting ridge to Mt Pomany is a very narrow rocky saddle with perilous drops on either side. Shortly before this saddle there is a very large cairn with rock pointers indicating the way to be taken. 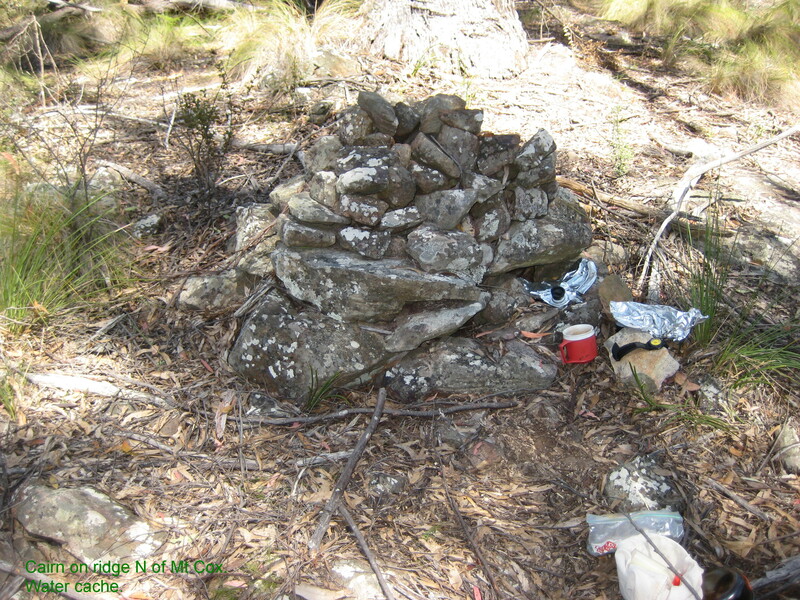 Historic note: This region was popular with cattle duffers and bushrangers in years past, legend has it this cairn was built by them as a route marker to Mt Pomany and Mt Cox where there was feed and water for their stolen stock. This narrow saddle was guarded by the duffers against unwanted intruders as was the only access to Mt Pomany. Slow progress through this thick scrub until scratched and bleeding came to the base of the Pomany Massif. Here my memory from my last visit of 28 or so years ago failed me and ended up taking a route up via a very steep rocky spur with difficult scrambles. After climbing this came to still steep but now grassy slopes which I plodded up until with much relief came to the plateau. Walked along this until came within sight of the Mt Pomany trig. Happily dumped my rucksack onto the ground having achieved a major part of the whole exercise. Freely admit was much elated at finally returning to Mt Pomany , my last walk was 28 years ago in 1987. Much has changed with access to this truly remote wilderness place, as I looked over the deep gorges memories came flooding back of those past years. A photography exercise followed of the stunning rugged grandeur surrounding Mt Pomany. Only later upon my return home found there was a technical fault with the pocket digital camera which resulted in poor definition images and bad exposure settings. Still enough detail to be useful. 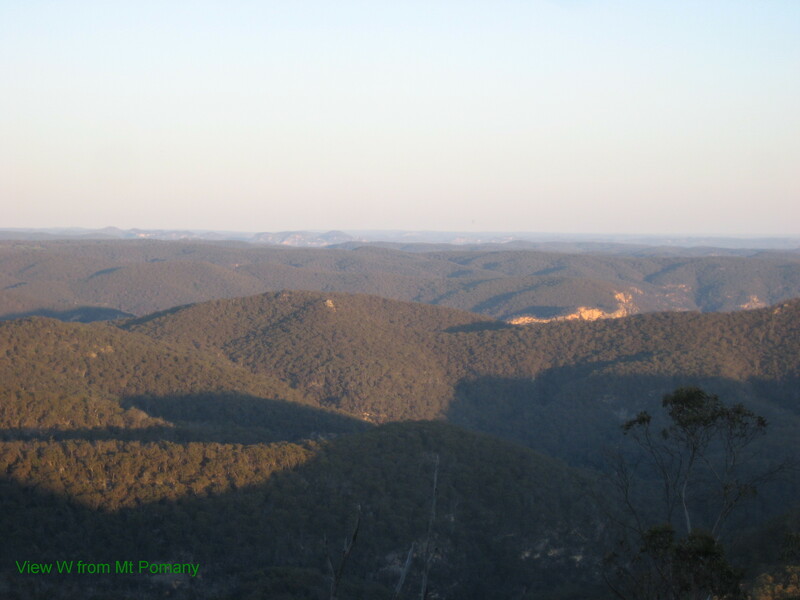 View NNE from Mt Pomany, Emu Creek gorge and Wedding Cake Mtn in the haze. 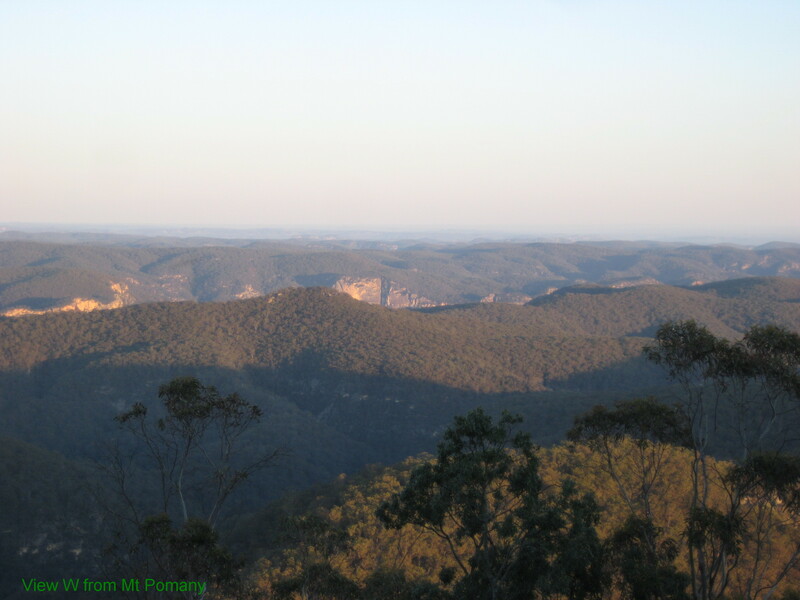 View W from Mt Pomany, the gorges and ranges go on forever. View W from Mt Pomany. Probably Bylong River gorge in far distance. View S end Mt Pomany. Ridges leading up to Mt Cox itself. NOTE: The low cairn marking the way down is not far from where this photo was taken. Back to radio set about stringing up the dipole and getting on air my first contact was with Ron VK3AFW at 0544Z on 40M. To my complete surprise found there was mobile phone access, put up a spot and upon switching over to 30M, DX came in IK1SOW, OK1KW, and later S58AL. The only 20M contact was with John VK6NU despite much calling. Even with applications of insect repellant biting march flies would try to feed of me which interupted radio activities from time to time. A total of 33 contacts which successfully activated this remote wilderness summit for the first time. Around 0740Z closed down and set up camp for the night. Another fireless night as the whole of the Pomany plateau was covered in thick grass making fire lighting to risky. After another nuts and raisins meal there was nothing more to do than lie there enjoying the great canopy of stars in the heavens above. 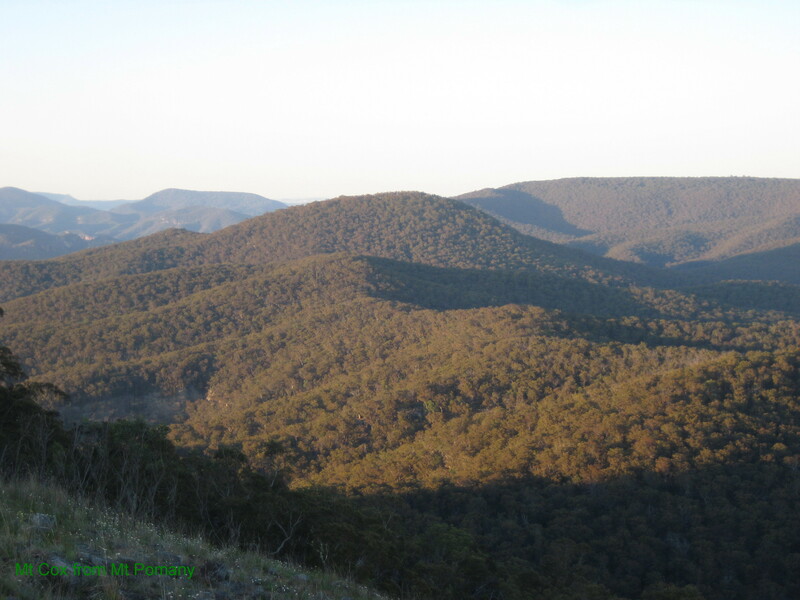 Tuesday 6th very pleased with the three 1st activations began the two day trek back to the car at Nullo Mountain. 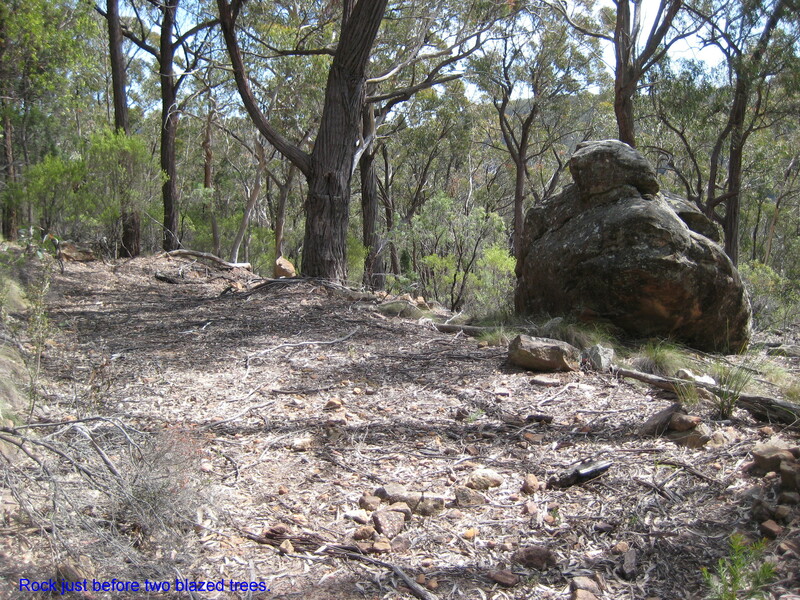 At the SW end of the Pomany plateau found a low stone cairn which marked the easy route down the side of Mt Pomany. Very steep, much scratchy scrub in places but only took about 15-20 mins to get down to a spot where I could pick up the ridge line back to Mt Cox. Another struggle through the thick scrub till I came to the water cache near Mt Cox and had a good drink as by then had run out of water. The rest of the walk was a steady repeat of before except for the unbelievable tangle of fallen trees and thick scrub around the eastern side of Mt Cox. It was impossible to take a compass line thanks to heavy scrub. 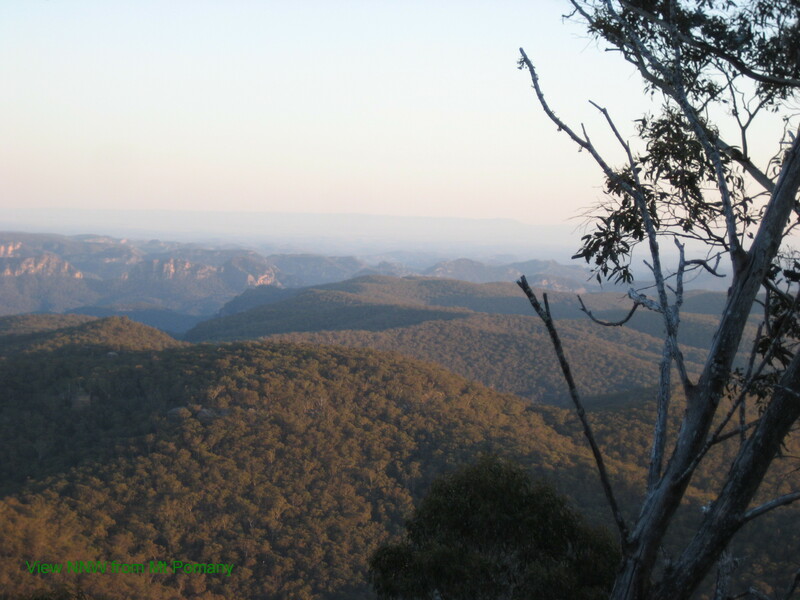 Arriving late in the afternoon at Hoolem Boy Gap went down to the grove of tinkling bellbirds and filled my water bladders with sufficient supplies for the night and next days walk. 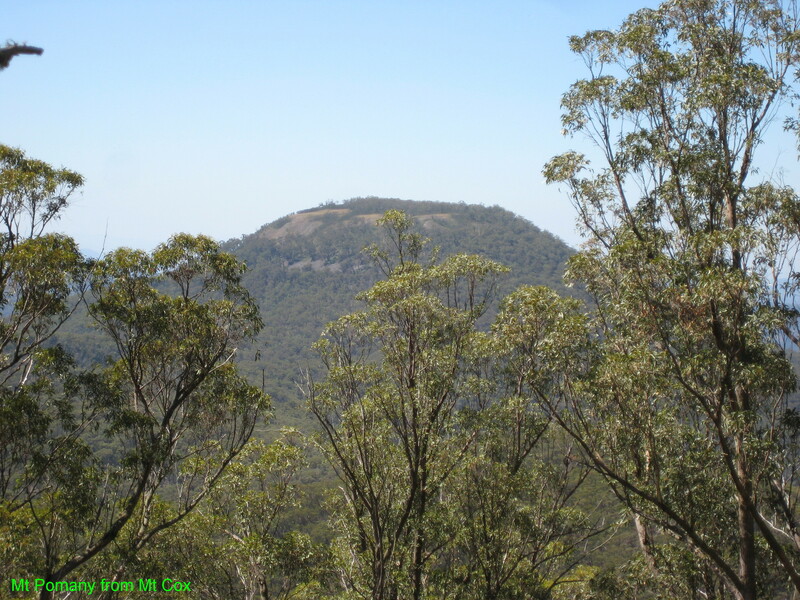 Wednesday 7th the trudge up to Nullo Mtn was uneventful except of course steep and very hot. At least I had plenty of water to drink and had many rest stops. Once past the last steep pinch the walk along the Nullo Plateau was a stroll through a grassy well timbered forest. Back at the car at lunchtime made a hot cup of tea, the first in three days and ate lunch from provisions left in the car. The first good wash and change of clothing which was a relief after so many days. The great wilderness oddessy that took so much preparation and planning was over. In the end all of the three summits were successfully activated for the first time. A total of 33 contacts with only 3 DX contacts. As I arrived late at the summits and to be quite truthful was quite physically exhausted by the time I arrived and set up the radio was not on air for a very long time. Usually about one and a half hours or much less which limited on air operating time. Think it fair to say there will not be many activations of these hard to get to summits as access is quite difficult.